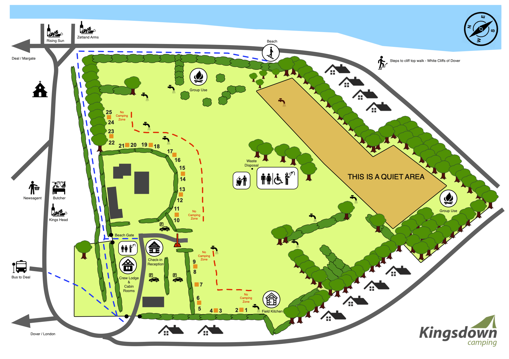 ﻿ Set within a stunning 35-acre cliff-top estate Kingsdown Campsite offers visitors a truly memorable camping experience. This beautifully located campsite enjoys panoramic sea views and easy walking access to the beach, golf course, village shops and three popular pubs. Our priority is to offer our guests a safe, relaxing and unforgettable camping holiday so whether you just want to sit back and enjoy the scenic surroundings or explore the area this is the perfect campsite for you. “Seeing the sunrise over the English Channel and cooking marshmallows on our campfire is a memory I will treasure with my children forever; a wonderful campsite and holiday. Thank you”. Please ensure that you have booked before arriving on site. Camping Arrival times between 10am - 6pm ONLY. We do not accept any (twin axle) Caravans, Winnebago’s or large Motor Homes. Max Caravan size permitted = 6.5m (21ft) roads into campsite are unsuitable for larger vehicles. The Camping Centre does NOT cater for Hen, Stag or Birthday parties. 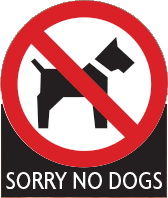 Please note - We do not allow 24 hour arrivals. We promote a family, not a festival, style atmosphere. Unlike most campsites that use a pitch system we allow you to choose where you want to camp but we limit availability to a maximum number of people. Once this number is reached we will not accept any more bookings for that period. This means our guests have plenty of space and avoid large queues for toilet & shower facilities especially during the busy summer months. We do not accept any under 18s camping without an accompanying parent or adult guardian. Proof of age will be required for any groups that appear to be under 21 and unsupervised. Message to parents “Go camping with the kids/teens, you'll love it, remember they're only young once”.